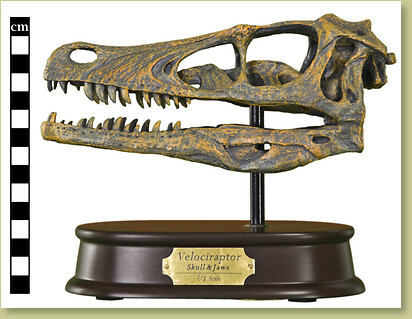 This 1/1 scale Velociraptor skull was sculpted using the latest scientific information, cast in poly-resin and is beautifully presented on a wooden base with a brass ID plate. This skull is the actual size of a real Velociraptor! This Asian theropod raptor skull is sure to please the dinosaur collector. Collect all the different Favorite Collection skulls.